I don’t know about you, but it’s been a long week for me. 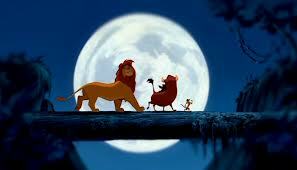 I met a huge deadline and it went well, but now it’s time to embrace a little Hakuna Matata. But seriously, what do you expect from a warthog? Well, you’ve got to get in the Dance-Party mood somehow. That beat had to put a sway in those hips. No, I’m not inferring they are as big as Baloo’s! Chill, will ya? Now go get your boogie boots. And make John Travolta wish he were like you-hoo-hoo! Note: Hula skirt, headdress, and coconut face mask are optional. Those Jungle Book scenes have always made me smile, and want to dance (like Baloo!). I learned in later years that my friend, Frank Thomas, and his compatriot Ollie Johnston animated most of the Jungle Book themselves. Walt Disney died early in the development of that film, and the animation department at Disney was under scrutiny for being cut. The Jungle Book’s huge success saved Disney feature animation. A wonderful against-all-odds success story that came from a love for their art.